CD review: "Mo' Cream From the Crop"
Some nine decades after inventing jazz only to watch outposts like Kansas City, Chicago and New York take possession of that invention, New Orleans is again a cradle of creativity. What with the Marsalis clan, the Dirty Dozen and Rebirth brass bands, Terence Blanchard and Donald Harrison, the Crescent City is not only reminding of its transcendent role in the creation of the music, but is producing a young generation of innovators to carry the music forward into the next generation. Among the young bloods stepping to the fore is Leroy Jones, an already-veteran trumpet player who's gigged with Harry Connick Jr. among others. While many of the above artists were recording under their own names a decade ago, while still in their teens or early 20s, Jones is slightly older than they are. But if he's gotten a late start in reaching a national audience as leader, well, that's as much our loss as his. 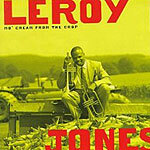 Jones has as sweet a tone on horn as you'll ever hear, and his timing is exquisite. His vocals are reminiscent of Louis Armstrong's without being plagiaristic  he brings his own nuances and phrasing to his colorful vocal growl. The material here on his first outing as leader ranges from covers of standards like "How Come You Do Me Like You Do" and "When My Dreamboat Comes Home" to Ellington's "Mood Indigo" to several of his own compositions. Each song is marked by Jones' ability to marry old-line jazz traditions to contemporary musical sounds (much as Miles Davis was always able to do)  with a New Orleans swing to it.